Spinnaker Software Corp. has developed two terrific ideas into programs for young children. Facemaker, designed for children aged four to eight, is a program that allows you to create and animate funny faces. Story Machine, for children aged five to nine, allows you to write a story at the keyboard and see it animated. One of these terrific ideas was developed into a terrific program, while the other one falls a bit short. Have you ever had a secret desire to design and animate your own cartoon? Have you been looking for software that can be used to introduce computer programming to children as young as four? Do you like a good chuckle now and then? If you answered "yes" to at least one of these questions, Facemaker deserves your attention. Although designed for four- to eight-year-olds, Facemaker appeals to older children and adults as well. Facemaker has three major options available. First, it allows you to design a face and, second, you can determine how the face should be animated. The third option is an entertaining and memory-building game. To design a face, you choose from a series of menus of mouths, eyes, ears, noses, and types of hair. There are eight possible choices for each of these features; this permits a large number of possible different faces. As each feature is chosen, it is added to the face, so the face takes form right before your eyes. The choice of features is varied and creative, and the method of selecting them from the various menus is simple enough for even young children to learn. When you want to make another face, you replace the features, one by one, on the old face. It's almost like a metamorphosis taking place before your eyes. Some of the children who looked at this program felt they would like to be able to build all of their faces from scratch. This can't be done once the first face is created, unless you turn the computer off, take the diskette out, and begin all over again. Once a face is designed, you can animate it. In animating the faces, you are essentially writing a program, a list of instructions for the face to follow. Choices here include wink, cry, smile, frown, tongue out, and ear wiggle. To make it easier for young children to use this program, each of these options can be specified with just its first letter. A typical program might be WTWFCW-EEW. This would cause your face to wink, stick its tongue out, wink again, frown, cry, wink a third time, delay a moment, ear wiggle twice, and end with a wink. All of this can be accompanied by appropriate sounds. I've yet to see anyone, adult or child, animate a face and not giggle when the program is run. 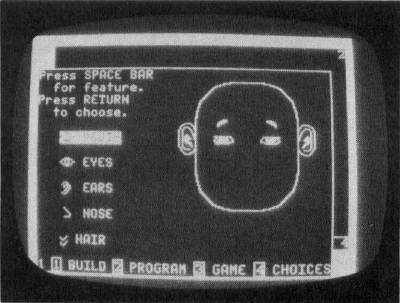 The third option, or memory game, is also based on a face you've designed. If you choose to play the game without having designed a face first, you'll get very strange results, so be sure to play the game after you've built your face. In this game, the face you've designed will animate, and the object is for you to specify exactly what steps were involved in the animation. If you get it right, one more step is added to the animation the next time. For example, the first time the face may wink and frown. If you respond with the correct sequence, you're rewarded with a smile and a wink, and a third action is added to the animation. This continues until a mistake is made. One criticism I have of this program is the way it handles a mistake — the tongue is stuck out, and unfriendly sounds announce your error. I would be sure to alert children to this before letting them use the program. 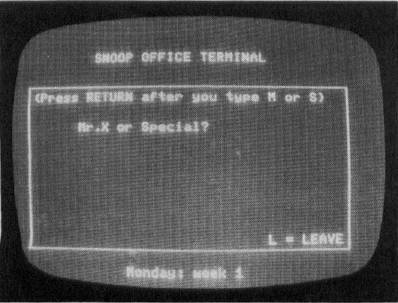 A typical screen common to both Snooper Troops #1 and Snooper Troops #2. The screen layouts for this program are very pleasing, and not too complicated or crowded for use by young children. Documentation for Facemaker is minimal, but that's all that's needed since the program is very user-friendly and clearly explained. Facemaker might be the ideal program to accomplish several different objectives. Introducing young children to programming by writing programs for the created characters would be an excellent way of exposing them to an important programming concept. This program would also be an ideal invitation to try a computer — for people of any age that have some anxiety about sitting down at the keyboard. I suspect that few people would turn down an opportunity to design their own animated cartoon. Facemaker also lends itself well to presentation to a group of people. Various people can contribute suggestions to the building of the face, and the animation can be a group effort. Children love to make up stories. They also love to watch cartoons judging by the number of Saturday morning cartoons on television. A recognition of these things that are enjoyable to children is behind the development of Story Machine. Using the words allowed in the program, you can write stories at the keyboard. As the story is typed in, Story Machine uses the top portion of the screen to illustrate the story. When a sentence involves action (such as "The dog goes to the store. "), the program will actually animate the sentence. Building a face with Facemaker. 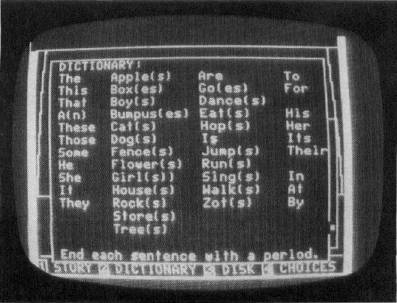 Story Machine provides a dictionary of 45 words, divided into seven categories: (1) articles, such as the, a, and an; (2) adjectives, such as this, that, and those;. (3) pronouns, such as he, she, and it; (4) nouns, such as apple(s), —dog(s), and girl(s); (5) possessive pronouns, such as his, her, and its; (6) verbs, such as are, eat(s) and run(s); and (7) prepositions, such as at, by, and to. Begin each sentence with an article, pronoun, or adjective. Use present tense verbs (run, not ran). A period or prepositional phrase must follow a verb (run to a house). Pronouns can be used only for the last noun used as the subject of a sentence. End each sentence with a period. Only four actors (nouns) may appear on the screen at any one time. A BOY RUNS BY A BOX. AN APPLE IS IN THE BOX. THE BOY EATS THE APPLE. THE BOY GOES IN THE BOX. Words are chosen from the dictionary to spin a yarn with Story Machine. Eagerly anticipating seeing my story animated, I began to type in the first sentence. Here is a running commentary of my experience. I typed "A BOY" (picture of a boy appeared on screen), then "RUNS BY" (BY got a slash through it and was then erased). I guessed I couldn't do that, so I typed in "TO A BOX" (picture of a box appeared on screen, and the boy ran to it!). Now, on to the second sentence. I typed "AN APPLE" (apple appeared on screen) "IS IN THE BOX" (message IT'S FULL appeared on screen, BOX got a slash through it, and my whole sentence was automatically erased). Oh well. I decided I'd try a slight modification and continued typing. "AN APPLE" (apple appeared on screen) "IS BY THE BOX" (message NO SPACE appeared on the screen and, again, my whole sentence was erased, but the apple stayed on the screen although there was now no sentence mentioning it). I decided to stop trying to relate the apple to the box, and went on to the next sentence. I typed "THE BOY EATS THE APPLE" (message MUST BE CLOSER appeared on screen, and again my sentence was erased). Assuming the boy needed to be closer to the apple in order to eat it, I typed in "THE BOY GOES TO THE APPLE" (boy on screen moved toward the apple). A BOY RUNS TO A BOX. THE BOY GOES TO THE APPLE. THE BOY GOES TO THE BOX. I felt quite frustrated. That's not at all what I had wanted my story to say. Typing in my other two stories proved equally frustrating. The sentences that were acceptable to the program were very limited, with more being rejected than accepted. Story Machine allows stories, once written, to be saved on a diskette. This option would allow children to go back and enjoy their old stories over and over. In a classroom situation, it would also allow them to be shared with others. The idea for creating a program like Story Machine is excellent and educationally valid. Unfortunately, in its present form it could well be more frustrating than educational for children at the appropriate age to use it. To be useful, it would need to accept a much broader array of sentences — ideally any sentence that is correctly formed with the words available in the limited dictionary. Because the program is such a terrific idea, I hope the Spinnaker people put out another version that will accept any syntactically correct sentences. I also took a quick look at Snooper Troops, Case #1 and Case #2. These two adventure games, designed for people aged ten to adult, are based on two different who-done-it type mysteries. The adolescents in my neighborhood loved them, comparing them favorably to other adventure games they've spent time on. They can develop logical thinking skills to narrow in on the culprit.